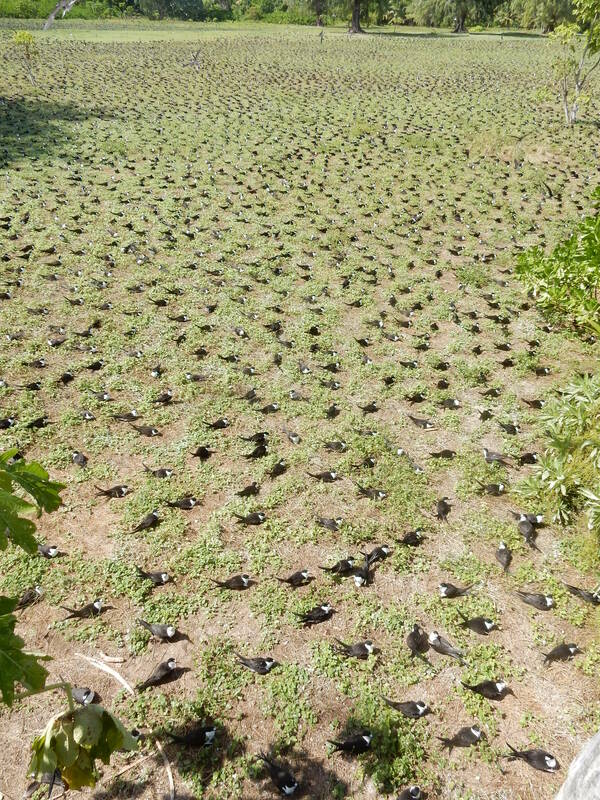 The Sooty Tern colony is now densely packed with birds. The first birds that laid are now about half way through their 28-day incubation period and these parents are already becoming more aggressive towards us as we visit our study plots. Our ankles are being regularly pecked, sometimes drawing blood, and more and more we experience adult Sooty Terns settling on our heads or, more frequently, delivering a heavy blow with their feet, bills or even deliberately flying into our heads with the full force of their diving bodies. This behaviour will intensify as incubation progresses toward the hatching of the egg. This is their defence against human intruders. This determination to protect the egg is immensely useful to us as researchers, since it results in the nesting birds being remarkably resistant to our activities. We keep these to a minimum, however, as we wish to study their biology under circumstances that are as close as possible to the situation without disturbances. On Bird Island there are few other threats in the colony to incubating birds or their eggs. Common Mynas and Ruddy Turnstones occasionally take eggs from around the margins of the colony but do not venture into densely occupied areas, where they would face a barrage of sharply pointed bills. The only predators that live within the colony are Land Crabs (Ocypode cordimana), which are also important scavengers. 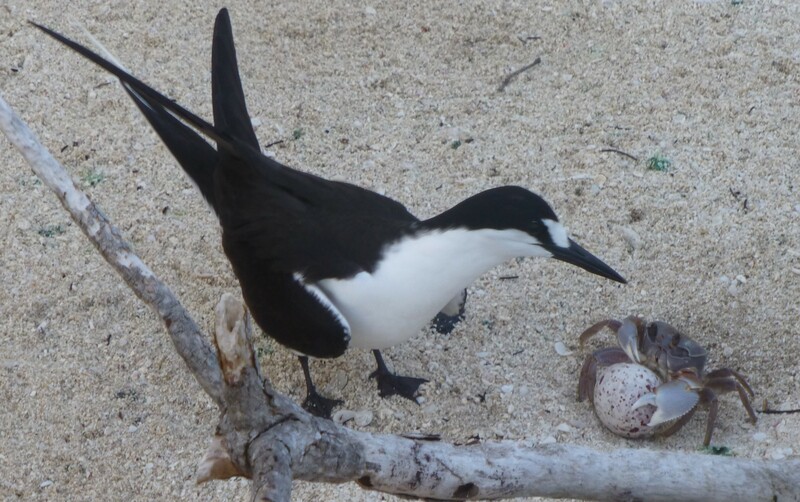 Incubating Sooty Terns drive them away with repeated stabs but eggs left temporarily unattended, for example when the incubating adult leave the egg for a brief drink just offshore (see post of 16 June), are vulnerable to land crabs. Formerly, Cattle Egrets nested on Bird Island (they disappeared during the rat eradication – see below) and they ate some unattended eggs and also chased recently fed chicks to make them regurgitate their last meal, which the Cattle Egrets eagerly devoured. Sooty Terns are more susceptible to predation by animals that man has, deliberately or accidentally, introduced. Cats are particularly harmful as they readily take adult Sooty Terns as well as chicks. When Bird Island was infested by Black Rats, from the late 1960s until they were eradicated in 1996, they had little impact on Sooty Terns (but they did affect Brown Noddies and White Terns, and possibly White-tailed Tropicbirds and Wedge-tailed Shearwaters, but no data are available). Where Brown Rats have reached islands with Sooty Terns, however, they have been devastating. On Bird Island Black Rats were eradicated in 1996 by New Zealander Don Merton owing to their effects on both wildlife and tourism. This was the first rat eradication to have been undertaken in Seychelles and paved the way for attempts on other islands in later years. In the early 1990s domesticated Rabbits had also been accidentally introduced to Bird Island and these were also removed during the rat eradication programme. Up to that point small numbers of Cattle Egrets had nested on the island but they also succumbed to the poison used to eradicate the rats. Cattle Egrets have subsequently been seen on the island on a number of occasions but they have never re-established a breeding population. This casualty of the eradication shows that environmental risks can be associated with these procedures and these risks must be considered when planning island rehabilitation projects. 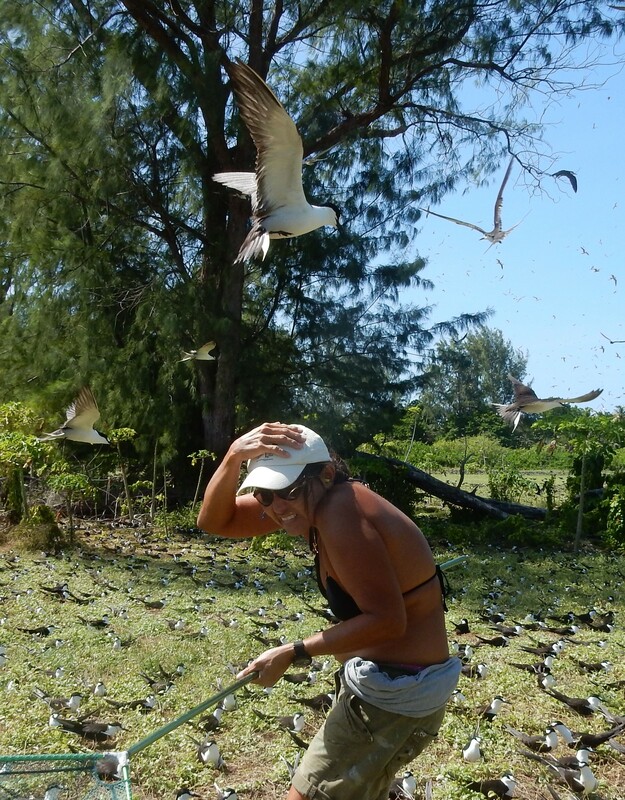 In Bird Island’s case we can say that the removal of rats has been highly beneficial to seabirds and tourists alike! Another post from Chris on Bird Island. Terrific place, and even more so in nesting season!